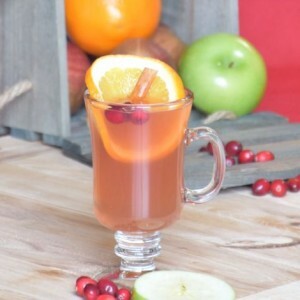 The perfect warm and spicy Christmas Drink, this cranberry orange spiced cider is mulled in the crock pot for 3 hours and needs no added sugar. Just enjoy the delicious smell of it simmering and savor the flavor of the holidays. Thinly slice your orange and place it in a 3-4 quart crock pot. Add all other ingredients except the vanilla. Cook on high for 3 hours, or until the cranberries split open. Scoop out the fruits and spices. Add the vanilla extract and stir. Strain into a pitcher or carafe for serving. Garnish with orange slices, apple slices or cinnamon sticks if desired.